How exciting would it be to barter or swap your services with entrepreneur and marketing guru Gary Vaynerchuk? Gary announced via social media and on his website “Gary Vaynerchuk” that he is looking to barter his services with food and beverage start-ups. “The truth is that I know I can offer some snack and beverage suppliers/companies out there significant value in comparison to the cost of the goods that I’m looking for,” he said. So, why barter and trade? Earlier in his career, Gary grew his family wine business from $3 million to $60 million in a five-year period. He now runs several successful businesses including a full-service advertising agency. Where he provides strategy services to Fortune 100 companies such as General Electric, Anheuser-Bush, Mondelez, and PepsiCo. Gary also admits that he has always had a love for bartering and comes from a trading background like baseball cards, comic books, wine and garage flipping. However, over the last three to five years he’s been fascinated with the barter economy. “Frankly, I genuinely believe that over the next decade or two, as information and technology advance, one of the next eBays, Airbnbs, Ubers, and overall two-way marketplaces will be a bartering system. We’re just going to trade, trade, trade”, he added. “I think the exchange of goods and services within the context of people owning stuff that is of less value to them, but of considerable value to others, and vice versa, is an incredible trade,” says Gary. Companies that are interested need to fill out a form, but keep in mind he cautioned “That if you’re asking for $100K in services from me, I’m going to expect $100K in coffee, chips, or goods in general in return”. “Please keep in mind that I’m not looking to trade agency services outside of the ones listed above in exchange for the snacks/beverages being supplied,” explains Gary. If you’re looking to leverage your inventory to purchase services that you’re already spending cash on, then it’s a no brainer and a win-win for both sides. However, like any barter deal even one with Gary Vaynerchuk you need to understand your margins and risk. 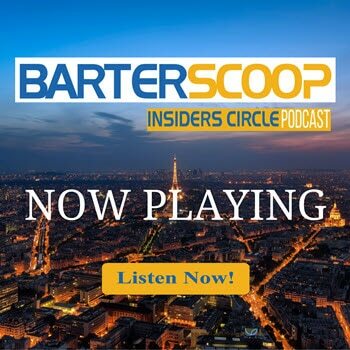 As explained in Episode 7 of BarterScoop Insiders Circle (BSIC) Podcast on Cash Converting. So, if you are a food and beverage start-up and want to barter your services with one of the best marketing minds today then here’s your chance to “Crush It”.